Location: Snow-bound in the Sierra Nevada mountians. 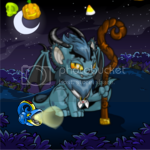 Though I've lurked about, mostly to pick my dream-pet colors, this is my first foray into the forums here. I've been playing on Neopets for only about 10 months, so I'm still feeling my way around a bit there too. Started out with a real Xweetok obsession. But then I discovered the Tyrannian Gelert, and my plans for an all Xweetok family went right out the window. Welcome! I lurked at NC for quite some time before posting, too. We love the lurkers here. Welcome to Neocolours, fellow Tyrannnian Gelert owner! Thanks for the welcome! Nice to meet another Tyrannian Gelert owner! Despite the typically bad wing attachment, I love the color. It's nice to get a cool winged character other than the super expensive Darigan or Faerie options.